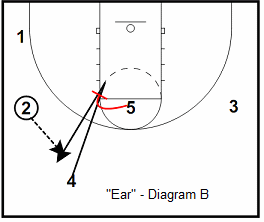 Here are a several Princeton-styled plays that you can call while running the Princeton offense. 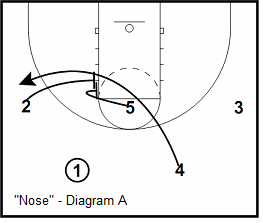 Also see: Pete Carril's Princeton Offense, Princeton Offense. 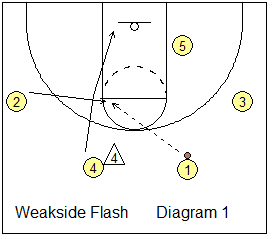 Princeton-style play - "Weakside Flash"
From Coach Lee Deforest, run this play when O4 is being denied the pass from O1 (diagram 1). 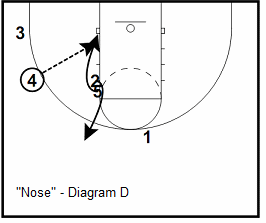 Weakside wing O2 flashes to the left elbow for a pass from O1. 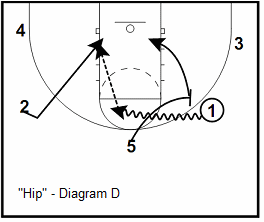 O4 then cuts around O2 for a possible hand-off and dribble-drive. If O4 does not get the ball, he/she moves out to the corner (diagram 2). O5 sets a flex-type screen for O3. O3 cuts either under or over the screen, and a pass from O2 to O3 is the next option. After screening, O5 ducks in for a possible pass from O2 (especially good if the defenders switch the flex screen). 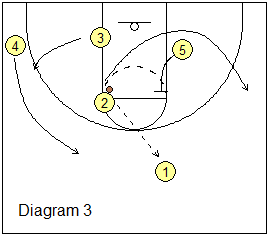 Alternately, if O5 is a good shooter, he/she might pop outside instead for a pass and an outside shot. If nothing develops, O2 just passes back out to O1 (diagram 3) and cuts through and moves out to the right wing. O4 rotates up to the top left spot, and O3 rotates out to the left wing. O5 back-screens for O1 and now you can run the "Chin" series from here. Another option (backing up to the start)... after the initial pass from O1 to O2, and after O4's cut, O1 then basket cuts (diagram 4). O1 curls around a screen from O4. 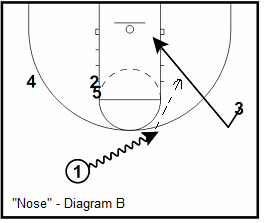 O2 dribbles toward O1 for a possible O2=>O1 dribble hand-off. Meanwhile we have the usual O5 flex screen for O3. See this YouTube video from Coach Lee Deforest. 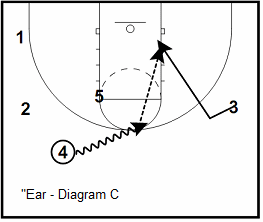 The next three plays, the "Ear-Nose-Hip" series, were submitted by Coach Mark Lane of the Ohio Express. See the diagrams below. In diagram A, O1 passes to O4 and cuts off of O5's screen to the ballside block (looking for the pass inside from O2), and then moves out to the left corner. O4 quickly passes the ball to O2. The first look here is O2 to O1 cutting inside. Diagram B... if the pass inside to O1 is not there, O4 either cuts all the way through or will pop back when O5 screens. 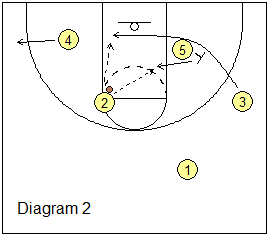 If you don't want O5 to handle the ball, then designate O4 to pop out every time. 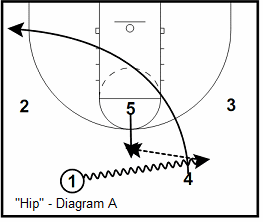 The pass back to O4 sets up the "dribble at" for the back door cut by O3. 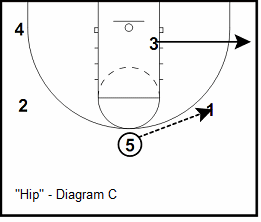 O4 dribbles at X3 to set up O3 for the back cut (diagram C). If O4 had cut through in the previous frame, s/he would have filled the opposite (right) corner and O5 would have popped out and dribbled at O3 for the back cut. In diagram A below, O1 dribbles at O4, who cuts through to the opposite side. O5 pops out and O1 passes to O5. Diagram B... O1 screens for O3. O3 steps above the screen and then backcuts (O3 never really uses the screen). This is the first look, a pass from O5 to O3 cutting inside. Diagram C (below)... to keep good spacing, O3 sees that O4 has the opposite corner filled and fills back to the side he came from. O5 passes to O1. 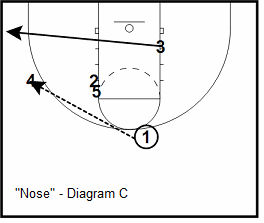 Diagram D... O5 follows the pass and sets up a screen and roll opportunity with O1. 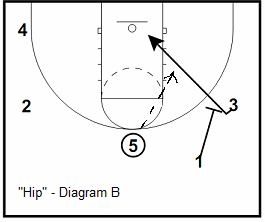 O1 dribbles around the ball-screen looking to score or hit O5. If O1 can't do either of those, he'll set up the back cut opportunity for O2. We used to run this starting on the left because we knew that we were going to ask O1 to make a pass to a cutter and felt it was easier for O1 to use his right hand instead of the left. 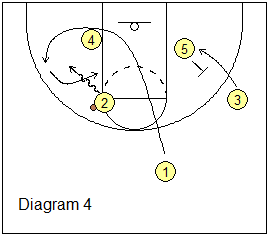 Diagram A... O1 "waves" O4 through and O4 will run off of a double screen set by O2 and O5 on the backside elbow. You would want to put your best shooter in the O4 spot for this play (assuming he's not your point guard). 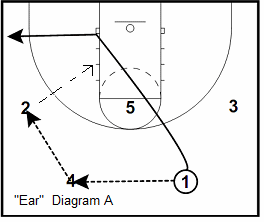 Diagram B... as soon as O4 clears out, this sets up the "dribble at" opportunity for O1 and O3. NOTE - This takes place almost simultaneously with diagram A. You'd be amazed at how many times O3 was open on the back cut. O1 to O3 is your first look. Diagram C (below)... if O3 is not open, he'll finish his cut to the opposite corner. O1 will then look at option 2, which is O4 going off of the double-screen. Note, O5's defender (x5) may start cheating to help on O4. If this happens, O5 may slip the screen. If we know this is going to happen, sometimes we'll hold O3 back from cutting to keep his defender out of the picture. We're hoping to have hit O3, or to have O4 get a shot by this point, but if not, we'll run O5 off of O2 (diagram D) and see if we can't hit O5 going to the basket or O2 popping out for a shot. A lot of times, both defenders go with O5 and leave O2 open. You could have O1 space out after passing and set up a O2 to O1 back cut opportunity!